E. O. P. | W.W.F.I.M. 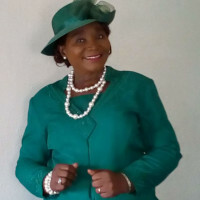 W. W. F. I. M.
Dr. Juliet M. Imaikop, is a woman of God with fire in her bones whom God has called, anointed and sent forth with the ministry of deliverance, healings and a prophetic anointing for this end-time, world-wide move of God. She is the Sr. Pastor of The Revival Mission Church, Director of Empowerment Opportunity Project and President of Women With Fire Ministries. Juliet is married to McDonald Imaikop who is the founder and Bishop of The Revival Mission Churches. They have five beautiful children. The Imaikops have been serving the Lord in ministry for more than four decades and have ministered in Africa, Europe and the United States. Dr. Juliet makes an impact with her voice whether she is speaking or preaching. With a powerful prophetic anointing she says it as it is, and you just watch the atmosphere change. She travels extensively throughout the United States, Germany, Africa and the United Kingdom.